Posted on Thu, Feb 23, 2012 : 12:29 p.m. The Manchester High School wrestling team will participate in the Division 4 team wrestling state finals for the fourth time in five years this weekend. In past years, the Flying Dutchmen had standout individuals at the heart of their team success. The year, according to coach Steve Vlcek , their success is very much dependent on depth more so than individual standouts. 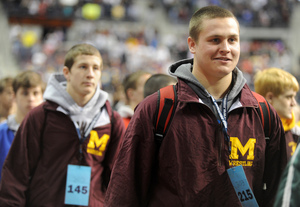 Austin Hamilton, pictured on right at last year's individual state finals, is Manchester's only returning all-state individual. Last year's team had three. Vlcek graduated nine seniors last year, including four wrestlers — Johnny Woolams, Austin Deacons, Ryan Abrigo and Dylan Neff — who were individual state finalists in their career. Just four starters returned from the team that advanced to the state semifinals last year. Click here to read the entire article at MLive.com.